Just say no? You try it. 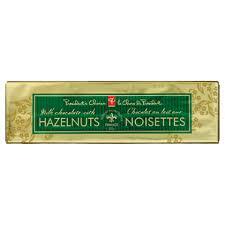 Even though the nutritional content label on the packaging doesn’t say so, I’m convinced that #President’s Choice Milk Chocolate bars with Hazelnuts contain an illegal substance. How else can I explain how once you bite into a piece of this #chocolate, you cannot stop. Weighing in at a hefty 300 grams, the chocolate bars are a product of France where they know their chocolate. The price of only $4.95 is designed to get you hooked and before long, you are a regular buyer and user. I’m speaking from experience. Sister substances include Milk Chocolate with Almonds, Dark Chocolate and plain Milk Chocolate. Before long, you too will be hiding it from family and consuming like a junkie in the bathroom when no one is looking. Don’t say I didn’t warn you. Available at Shoppers Drug Mart and Loblaws stores including Real Canadian Superstore.